Fibonacci levels are one of the most popular tools in technical trading. They’re used to find potential retracements levels during strong trends and are based on Fibonacci ratios, identified by the famous 13th century Italian mathematician Leonardo Fibonacci. Fibonacci ratios, such as the Golden Ratio, can be found in both natural and artificial environments. This includes sunflowers, galaxies and even the human body. A lot of the wonders of world hide certain Fibonacci ratios inside them, think Leonardo da Vinci’s Mona Lisa and the Parthenon. So, how do trades use Fibonacci levels in trading and why do they work? The Fibonacci sequence of numbers was identified by Leonardo Pisano, also known as Leonardo Fibonacci – an Italian mathematician born in 1170 in Pisa, Italy. Leonardo studied mathematics and is famous for popularising Hindu-Arabic numbers in Europe. In his book “Liber Abaci” (Book of Abacus), Leonardo described a sequence of numbers that return a constant ratio when dividing one number with the next number in the series. Each number in the Fibonacci sequence equals the sum of the prior two numbers. The sequence starts with 0 and 1, and continues as follows: 1, 2, 3, 5, 8, 13, 21, 34, 55, 89, 144, 233 and so on. This ratio (0.618) is well known as the Golden Ratio and can be observed in various natural phenomenon. What’s interesting about this sequence is that it always returns the same ratio when dividing one number with the next number in the series, excluding the first few numbers. For example, 34/55 equals 0.618, just like 55/89, 89/144, 144/233, and so on. This ratio (0.618) is well known as the Golden Ratio and can be observed in various natural phenomenon. By dividing each number with the number two places to the right, you’ll always get 0.382. For example, 13/34, 21/55, 34/89 and 89/233 all return 0.382 as the result. When used in trading, traders apply these ratios to determine where the price may retrace and to identify possible zones of support and resistance. Fibonacci trading has much to do with price trends. Fibonacci ratios try to identify levels where price corrections might end and reverse in the direction of the initial trend. Markets can stay in two types of environments: they can be either trending or ranging. Trends can be either up or down. An uptrend is characterised by the price making consecutive higher highs (HHs) and higher lows (HLs), while downtrends form consecutive lower lows (LLs) and lower highs (LHs). This is shown in the following chart. As the chart shows, the price forms a zig-zag pattern on its way up or down. The higher lows are actually price corrections formed during strong trends, and once the price drops far enough, buyers enter the market and push the price higher again. According to Dow theory, price corrections usually reach around 50% of the initial move. This is why most trading platforms offer Fibonacci tools that include the 50% level, although it’s not a ratio derived from the Fibonacci sequence. To successfully apply and trade on Fibonacci levels, a trader needs first to correctly identify the current market environment and trend direction. The main purpose of the Fibonacci tool is to identify where those price corrections might end. Traders look to enter with a buy position at the bottom of a higher low, and with a short position at the top of a lower high. How to Apply Fibonacci Levels on a Chart? To apply the Fibonacci tool on a chart, the first step you need to do is to identify the initial (impulse) move of a trend. This is the most difficult step, as different traders may identify different impulse moves and get different Fibonacci levels. An impulse move should be a strong price-move to the upside (during uptrends) or to the downside (during downtrends), without obvious price-corrections. 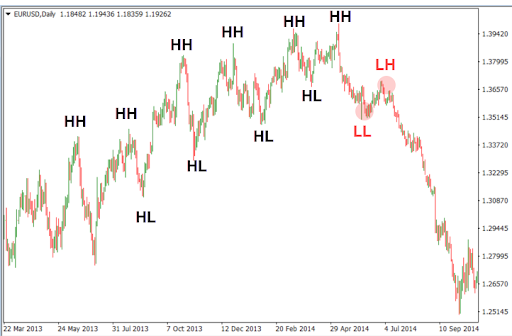 With experience, you’ll find it much easier to spot impulse moves and apply Fibonacci levels. 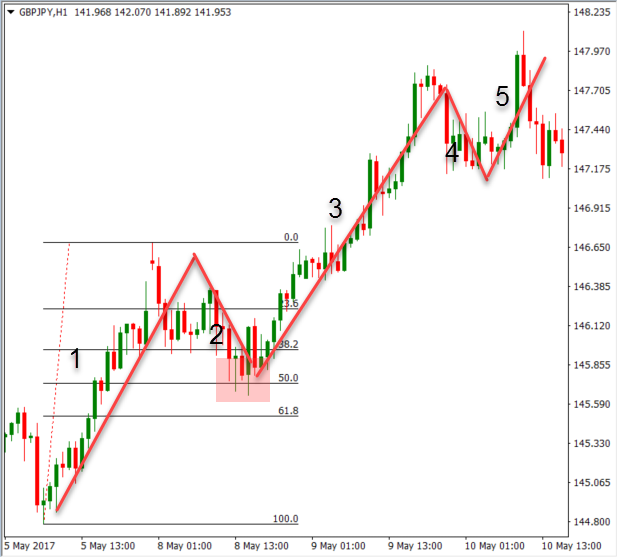 Once identified, draw the Fibonacci tool from the bottom to the top of the impulse move, as shown in the following chart (moves 1, 3 and 5 are impulse moves, while moves 2 and 4 are price corrections). The Fibonacci tool will automatically draw horizontal lines that represent the most important Fibonacci retracement ratios – 23.6%, 38.2%, 61.8% and the 50% level. 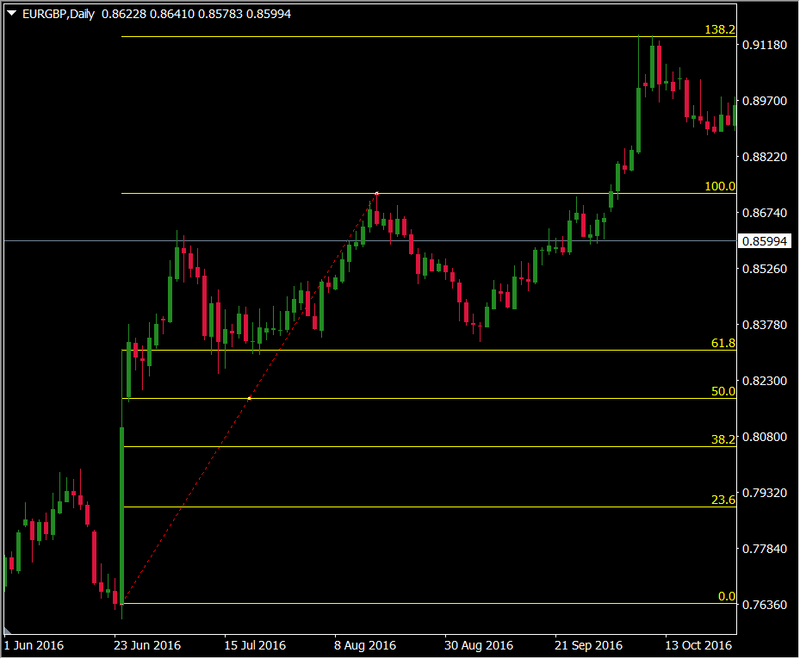 As the chart above shows, the price found support at the 50% level and retraced in the direction of the uptrend. After the price shows to respect a Fibonacci level (with a candlestick pattern, for example), a trader could enter into a buy position and place a stop-loss just below the respected Fibonacci retracement level. Besides measuring and identifying potential reversal zones of price corrections, Fibonacci tools can also be used to identify profit targets. These targets are based on Fibonacci extension levels, with the 123.6%, 138.2%, 161.8% and 261.8% levels being the most commonly used. Extension levels simply extend the drawn Fibonacci retracement levels in the direction of the trend. This is shown in the following chart. The EUR/GBP pair retraced at the 38.2% Fibonacci level (notice that the tool is drawn inverse), and reached the 138.2 Fibonacci extension level soon after. Even though Fibonacci levels are extremely popular among technical traders, one should not rely solely on Fibonacci retracement and extension levels in trading. Fibonacci tools return the best results when combined with other technical tools, such as trendlines, chart patterns, candlestick patterns, channels or technical indicators. … one should not rely solely on Fibonacci retracement and extension levels in trading. Since Fibonacci retracement tools try to identify potential price-levels at which counter-trend price-corrections could reverse, traders can use oscillators to check whether the price becomes overbought or oversold at certain retracement levels. Counter-trend moves, such as price corrections, will likely push an oscillator like the RSI into overbought/oversold territory which can act as an additional confirmation to enter into a trade. This is shown in the following chart. The Relative Strength Index reached overbought levels of above 70 exactly at the point where the price retraced at the 38.2% Fibonacci retracement level. Traders can also use other technical tools to confirm a trade based on Fibonaccis, such as trendlines for example. 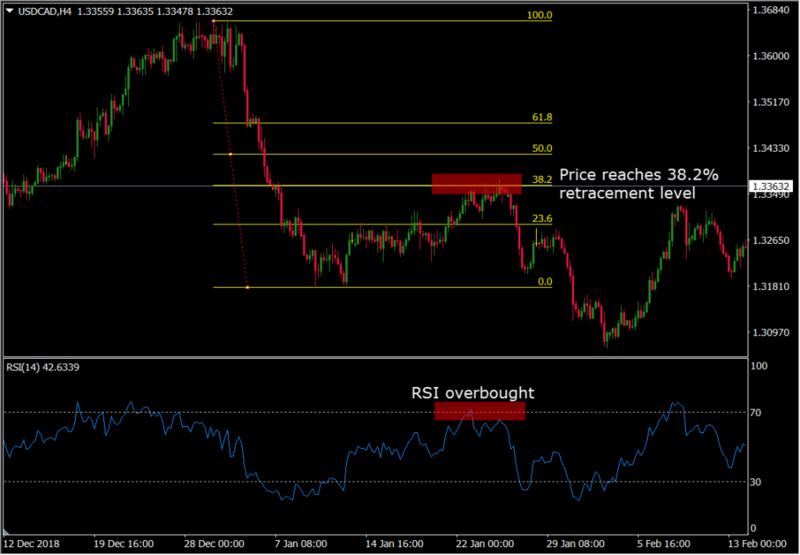 The chart above shows the EURUSD pair during an uptrend, with the price retracing at the 50% retracement level. This level formed a confluence zone of support together with the rising trendline, which made a great high-probability setup to trade on. How Reliable are Fibonacci Levels? Just like other technical tools, Fibonacci extension and retracement levels shouldn’t be used on their own. They return the best results when combined with other technical tools, such as technical indicators or trendlines for example. Traders can also combine them with chart patterns, candlestick patterns or fundamental analysis to take the most advantage out of them. The most critical part of trading on Fibonacci levels is correctly identifying the impulse wave of an uptrend or downtrend. Look for strong moves without obvious lower highs or higher lows as the beginning and ending point of your Fibonacci retracements. Since technical analysis relies to a large extent on self-fulfilling prophecy, try to focus on longer-term timeframes such as the daily for your Fibonacci analysis. The more obvious the impulse move and the stronger the trend, the more traders are watching those Fibonacci levels and the more likely will they be respected. Fibonacci trading is a very popular technique among retail traders, based on ratios derived from the Fibonacci sequence of numbers. 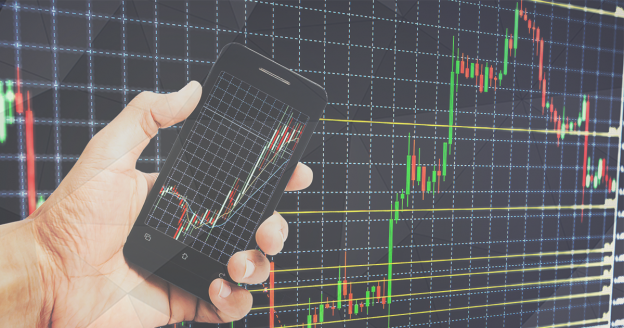 Fibonacci retracements are used to identify potential levels where price-corrections may reverse in the direction of the underlying trend, while extensions are often used as profit targets based on Fibonacci ratios. It’s important to note that the price doesn’t have to retrace exactly at a Fibonacci ratio. Rather, think about Fibonacci levels as of zones, with the zone between the 38.2% and the 61.8% levels being the most important one.